Publix, our grocery store, had tuna buy-one-get-one this week and that reminded me of our trip to Tunisia. Canned tuna was a staple there, it seemed. So, I searched the web and found a recipe for a Tunisian Tuna and Egg Brik, an item that we had while we were in Tunisia… and we enjoyed it there… lets see if I can make it here. Brik, pronounced “Breek”, is somewhat like a delicious turnover, but like a soufflé, it must be served immediately. A Tunisian brik always has an egg in it, but it can have tuna, potatoes, capers and parsley. The casing, malsouka, is a cross between phyllo dough and a spring roll sheet. A brik is deep fried, olive oil is best, then drained on a paper towel. The trick is to hold the triangular brik with the point up while biting into it and not let the egg run down your chin. Mix together tuna, parsley, Parmesan cheese, salt and pepper. Spoon about one fourth of the filling onto one half of each wrapper, making a well to hold most of the egg. Break an egg into each well and fold wrapping into triangle shape to cover the mixture and the egg. Seal both sides of the wrapping together. Fry in one half inch of hot olive oil (vegetable oil can be used, but olive oil works best). When brown on one side, flip over to continue frying. A couple minutes on each side is enough if the oil is hot enough. Serve sprinkled with lemon juice. They came out pretty good. Even though, the store had no eggroll or spring roll wrappers, and I had to substitute phyllo dough. My first time ever using phyllo dough. Perhaps not so far away after all. Many scenes in the Star Wars movie (Episode IV: A New Hope) were actually filmed in Tunisia. 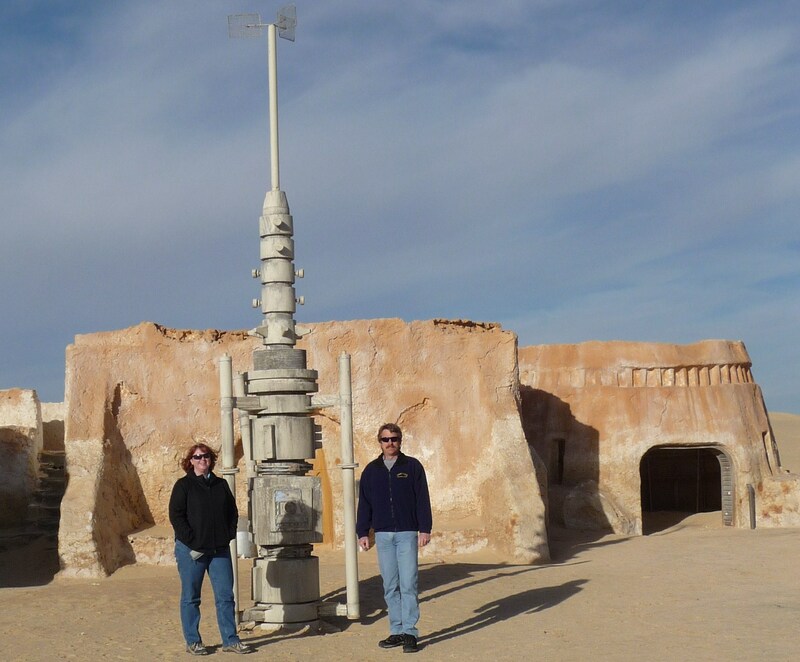 And we just returned from a two-week tour that visited four Star Wars film locations, one location used in the filming of a Monty Python’s Life of Brian movie, and many many historic “real life” locations. For such a small country, Tunisia’s history is epic! I’m not sure if it all started with the Punic Wars between Rome and Carthage, but that is pretty much where our tour started. The tour continued through the Rome empire, to the French “protection”, and then onto the US campaign during World War II. Present day Tunisia is an interesting blend of Muslin and Western law; for example women have had the same voting and eligibility rights as men since 1956. Tunisia is a confusing mix of the ancient still very much alive nomadic life of sheep herders living along side of (and sometimes inside of) thriving metropolitan cities. We are currently sorting through the over 3,000 photos that we took in the two-weeks and hope to have them posted within a month. Until then, here are a handful of photos showing us having a great time!